Dumpling, pot sticker, gyoza, jiaozi, dim sum…..
Truthfully, I’m not really sure how to differentiate between these wonderful little packages of bliss. I would love to waltz into a dim sum restaurant and cozy up to a server to get the lowdown, but due to my gluten allergy, I can’t. So while I can’t really educate you on all things dumpling, I can offer you a gluten free recipe that tastes yummy, even if it is something of a crossbred mutt. We will call it……dumpstickgoyadim for now. So I found a different dough recipe that wasn’t actually classified as a gluten free recipe, but because it only contained rice flour and tapioca flour it WAS gluten free, and after having made it….I decided it was the best way to go for me. Start by peeling and deveining your shrimp. Chop them, along with your mushrooms and green onion. Grate your ginger finely and then mince your garlic. Add everything into a bowl then add your soy sauce, ground pork, sesame oil, salt and a few grinds of fresh pepper. Mix all ingredients and place in fridge. Next, start your dough by adding your rice flour, tapioca flour and salt into bowl. Pour in your oil. Add in your just-boiled water and start to mix with a chopstick. 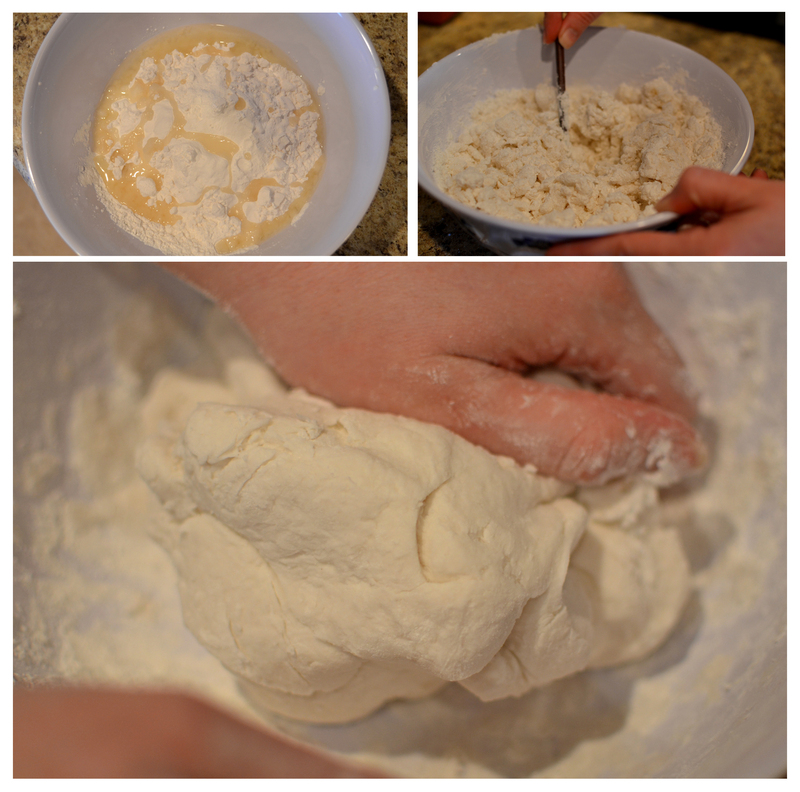 After water cools down a bit, start to knead the dough until it has a play-dough consistency. Now your dough is ready to be divided. Roll it out into a foot long rope (lightly dust the counter with rice flour) and cut in half. Place half your dough directly into a ziplock bag to keep moist. With the remaining dough, cut into 12 pieces. Place the pieces into the bag except a few that you are working with to keep everything moist. Repeat with remaining dough. Now you are ready to start pressing your dough into the dumpling wrappers. This can be done quickly and easily with a tortilla press. Cut a ziplock bag in half. Open your tortilla press and place half of the ziplock bag on the base. Lightly dust this with rice flour. Add one of your dough discs and cover with the other half of the ziplock bag. Close your tortilla press. When you open it, handle your wrapper carefully, as it is very delicate. Now you are ready to fill the wrapper with your meat. 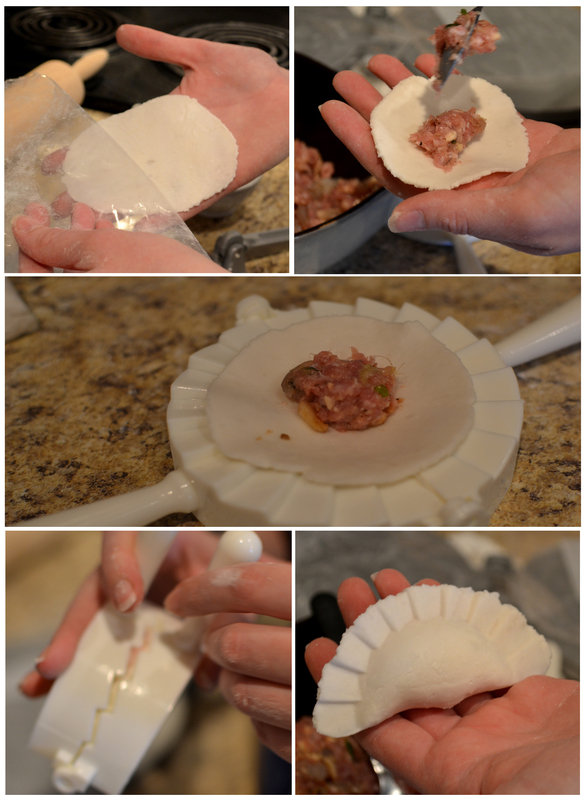 This is done very easily with a dumpling press. Place the wrapper in your hand, and fill with a small ball of filling. Around 1/2-1 tsp. 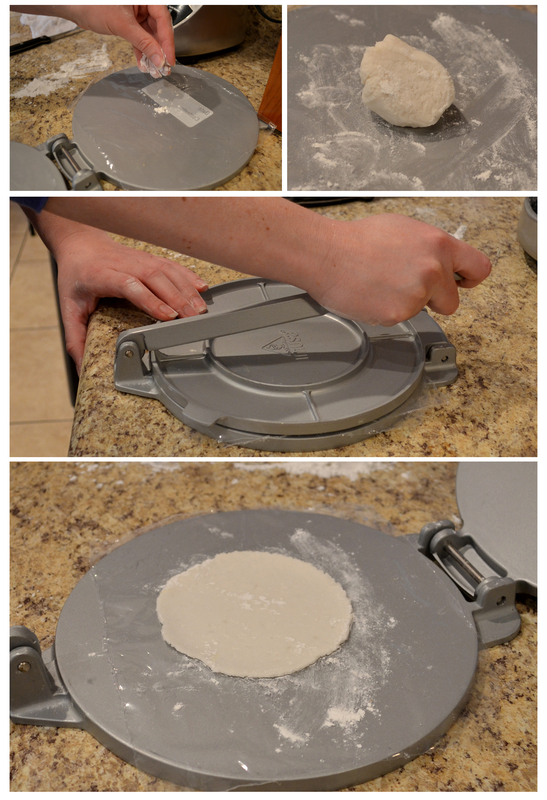 Place your wrapper in a dumpling press and gently press closed. Easy! you can press it out by hand the old-fashioned way. Take one of your dough discs and flatten it by hand. Cut a ziplock bag in half. Lightly flour half of the zipock bag and place your flattened dough disc on it. Cover with the other half of the ziplock bag and roll out with a rolling-pin. Gently take your wrapper and place your filling in it. Lightly wet the edge of the wrapper and close in half. 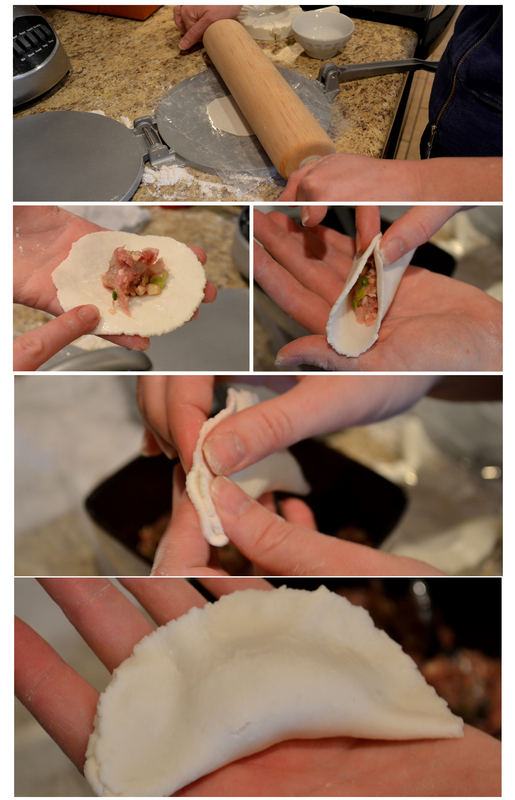 Pinch shut, and work your way around the rest of the dumpling to close. 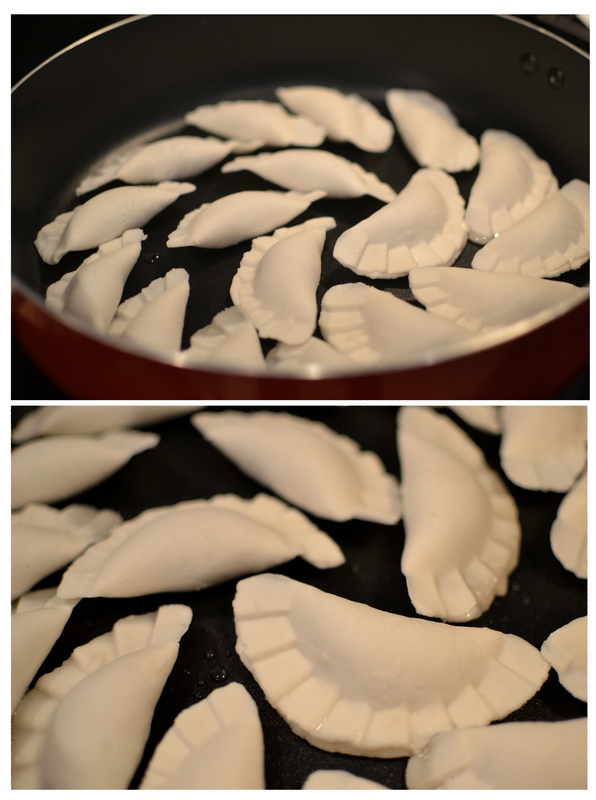 Place your pot stickers on a clean surface as you are preparing them. Once you have filled your wrappers, you are ready to cook. Heat your oil in a large saucepan. Add in your pot stickers. Let them brown for a few minutes. Add in 1/4 cup of water and cover with tight-fitting lid. Let the pot stickers steam for 6-8 minutes. You may have to cook them in two batches. Once your pot stickers are done, then you can plate them. Mix your dipping sauce and enjoy! There are some other amazing dumpling recipes online with some pretty awesome instructional photos…so here are some blogs to visit when you get the hankerin…. 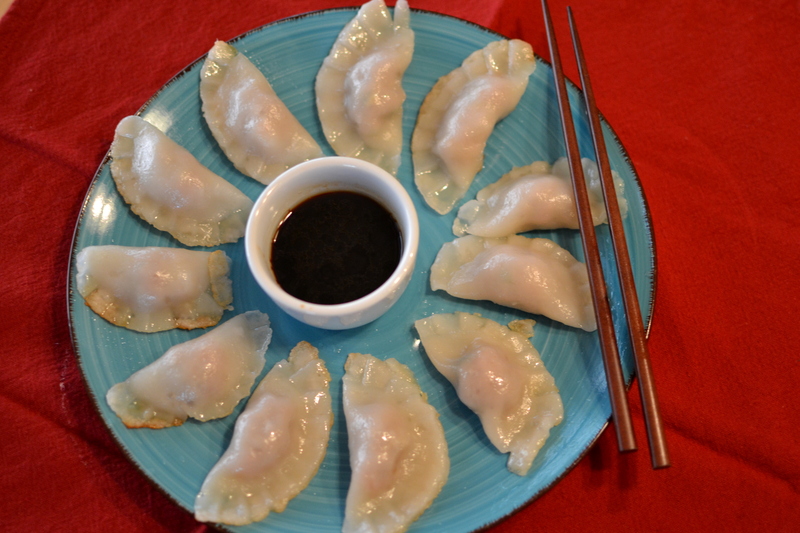 This entry was posted in Asian, Chinese, Japanese Recipes and tagged dim sum, dumpling press, gluten free blog, gluten free dumplings, gluten free potstickers, gluten-free, gyoza, jiaozi, pork, pot stickers, recipe, shrimp. These were absolutely amazing!!!!!!!!! I have looked at your other recipes and am soo excited to try them out these are easy and delicious thank you soo much!!!!!!!! 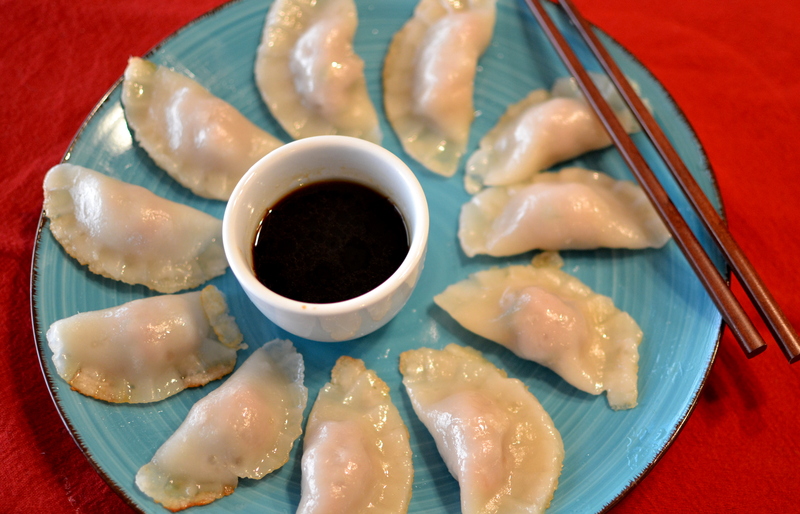 Gluten-free Asian dumplings were on my bucket list of things to make. I used a combination of your recipe and the one from Laura B. Russell for the dough. The result was amazing. Thank you for the great pics. Who would have thought to use a tortilla press?! Perfect tip. I made my own filling (ground chicken, sesame oil, scallions, garlic, ginger, salt and pepper) which my kids loved. The only problem was that I think I ate 6! I had extra filling and made mini meatballs. Thank you again! This was such a hit in our house! 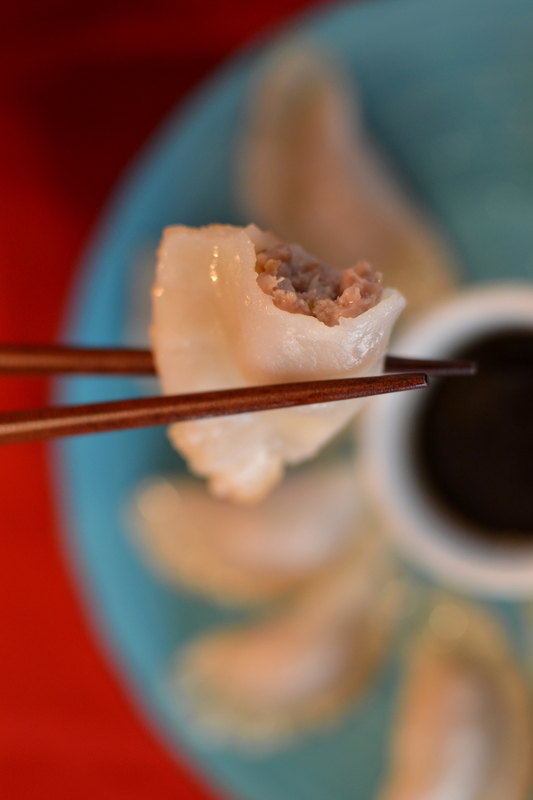 Gluten-free Asian dumplings were on my bucket list of things to make. I used a combination of your recipe and the one from Laura B. Russell for the dough. The result was amazing. Thank you for the great pics. Who would have thought to use a tortilla press?! Perfect tip. I made my own filling (ground chicken, sesame oil, scallions, garlic, ginger, salt and pepper) which my kids loved. The only problem was that I think I ate 6! I had extra filling and made mini meatballs. Thank you again! thanks for link…I’ll have to try out your recipe! these are delicious! finally a recipe that doesn’t require so many ingredients and is really flavorful. Do you brown them on both sides before steaming? I couldn’t figure it out and looked up another recipe which browned on one side, steamed, added more oil, and flipped over. I should have taken them out and let the second oil heat up for better results. Thanks for the recipe. Oh dear God, I shall have to KISS YOUR FEET! I tried my first gluten free dumplings last night (a recipe from one of the GF cookbooks I have acquired and was NOT happy at all. It was backbreaking, the dough didn’t want to roll, and the recipe called for SIX EGGS. EEK. Your using of the tortilla press is GENIUS (and I HAVE ONE!) and I might just have to go do the running man because I did not know of the existence of dumpling presses! Have just ordered one! THANK YOU THANK YOU THANK YOU. Thanks for the recipe, I tried these the other day, they worked great! I changed up the filling, but the dough worked great! I made these just now and I LOVE them! My son, age 8 who is very picky, ate 6 or 7! Thank you, thank you. Have you ever frozen them? I was wondering if you would freeze them before cooking, thaw and then cook? It’s going to be ending of mine day, except before end I am reading this great piece of writing to improve my know-how. your presentation but I in finding this matter to be really something that I think I would never understand. I am looking forward to your subsequent put up, I will try to get the hang of it! Scrummy Ice Cream, 2 bits of advice. If making dumplings is too hard (and it is), just make the filling. That’s pretty scrumptious. Secondly, if you haven’t worked with this type of dough before, there might be a bit of a learning curve. Did they fall apart? Probably not enough water. Did they stick? Try cornstarch to help hold them together. If you are new to making this dish, give yourself another chance. It’s worth it! Or just make little meatballs; those are good too. Can the potstickers be assembled ahead of time and fried/steamed later? Holy crap. These are soooooooo good!!!! Maybe other ppl have already mentioned, but I kept a bowl of water to dip my hands in when I was pressing into flat discs. Also, I would make about 1/2 more of dough. My discs tended to be a bit small, but totally made it work. Thank you!! This was a hit with husband and 10 yo son. would this work if boiled? or would they fall apart? thank you. not sure? Try it and let me know! These quickly became a favorite in my house. The filling is amazing (and, I admit I was skeptical about shrimp and pork together)! And, yes, the meatballs are delish too! Super easy with the tools you suggest. To those that had them fall apart, I think it happens when they get over-filled. They can only handle a very small amount of filling (1tsp very max). Thank you! Thank you so much for this! My 11 year old just was diagnosed with celiac, and her favorite dinner is potstickers. I really look forward to trying this recipe very soon! 2/28/15. Tried these today, mine needed more water. They were easy to roll and tasted great as potstickers. (Fried then steamed with a touch of water). When I tried them in a soup, the dough fell apart. Maybe I should have made it a little thicker. Taste was great. Thank you so much for sharing! One thing I’ve really missed since going gluten-free is potstickers. I used to treat myself with an order of them every Saturday at my favorite Asian restaurant. I made them yesterday (Saturday). Yummy. My mom said they tasted just like the regular ones. The tortilla press and dumpling press were a great recommendation and very cheap on Amazon. I left off the shrimp and just used pork. Thank you for sharing!!! Your filling looks quite raw, after steaming. So I wonder if that is the case, since i’ve to be really care full about that. What is your experience? Also, have you tried using chicken? it was fully cooked. I haven’t made this with chicken, but I’m sure it’d be tasty. Is the dough the right consistency for traditional folding? 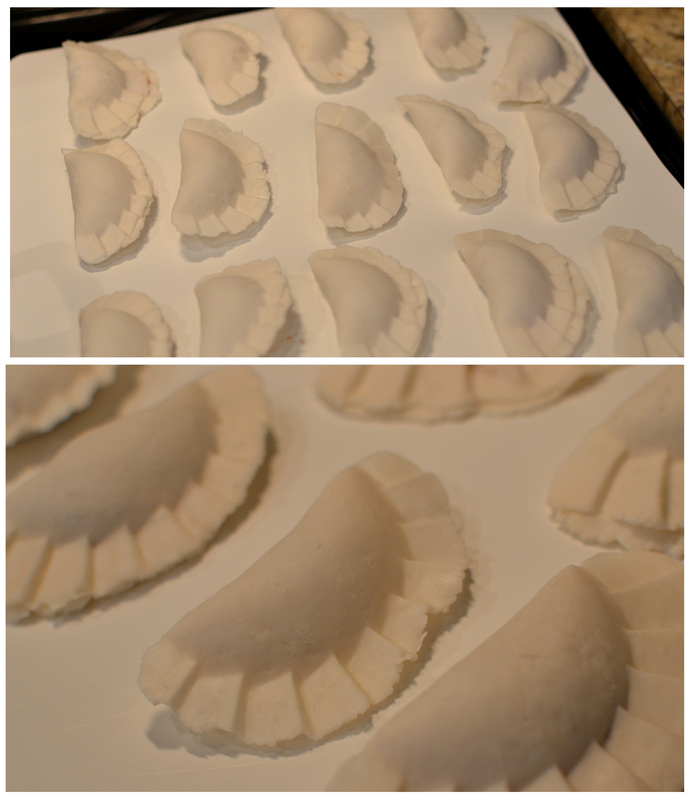 Being someone who makes very traditional dumplings for customers, folding them 10 different ways using traditional dough… I wonder if you can share with me if your GF dough will allow for the traditional folding, instead of using the plastic pie-press…. I did fold some and it worked well. Since I haven’t really folded a lot of wheat dumplings, I can’t compare, but I had no problem folding/pinching these by hand.